7 Quarter Tonners finished in the top 12 overall under IRC in last Saturday's Island Sailing Club's Round the Island Race. Tom Bombadil owned by Kevin George was 3rd overall, Purple Haze (Tony Dodd) was 4th, Super Q (Louise Morton) was 5th, Zipper (Russell Smith) - visiting the South Coast from Burnham for the QTC was 6th, 45 deg South (Laurent Beaurin) who sailed over from France was 7th and Arbitrator (chartered by Lawrence Mead) was 9th. It was great being able to measure how we were doing all the way round the Island and it certainly focused the crew on Super Q to sail as hard as we could. Crossing tacks after 10 hours sailing coming back up the Solent and finishing within a minute or so of Zipper and 45 deg South was a great experience. Catch (Darren Marston) came 12th overall and won her division. Tom Richardson of the Elephant Boatyard has made a beautiful trophy of an elephant sitting on a piece of carved wood the shape of the Isle of Wight to be given to the first quarter tonner in IRC each year. The Island Sailing Club have agreed to present it in future. 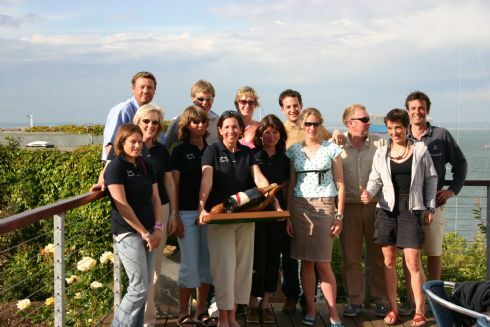 The RCYC won the team prize for IRC Division 3 in the Round the Island Race. The team comprised three Farr 727 Quarter Tonners - Super Q, 45 Deg South and Arbitrator.